We had a good time Thursday night at Bountiful Lake despite colder than expected water temperatures (56 degrees). We had five swimmers show up and we all got in the water. 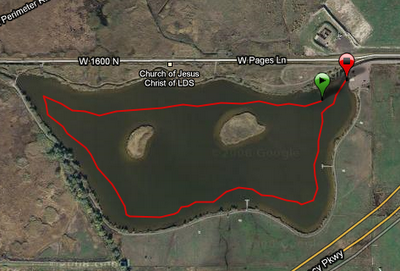 Three of us made the full 1 mile loop around the lake while the other two went back to shore to try to warm up. This is only the second time this year that I have been in water this cold and my hands and feet were tingling throughout the swim. Putting my face in the water was the worst part, it hurt until it went numb from the cold. The only downside of the evening was when Gordon lost his wedding ring after only a short time in the water. After the swim, a large truck pulled up to stock the pond with fish. We watched for a while as the fish came streaming out of the back of the truck and into the cold water. Now we know what we're swimming with! Man those poor fish have to live at that temp. How come they don't get hypothermia! I've got a heck of a lot more fat than they do!